Your manager wants to see a report on your latest sales figures combined with your last campaign impressions by the end of the day. But the latest data resides on various third party systems and on files in your laptop. In the past it’s taken hours to create visuals and format a report. You’re beginning to feel anxious. No worries. 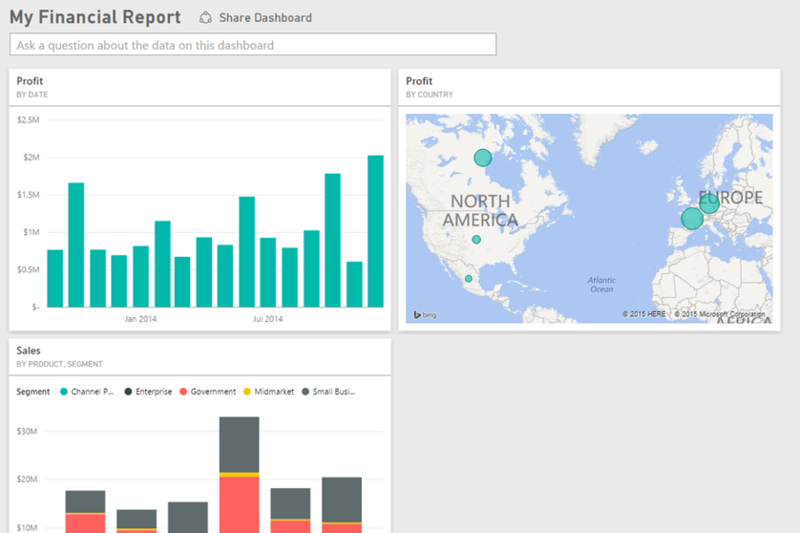 With Power BI, you can create a stunning report in no time. In this example, we’ll upload an Excel file from a local system, create a new report, and share it with colleagues—all from within Power BI. Let’s take a simple Excel file as an example. 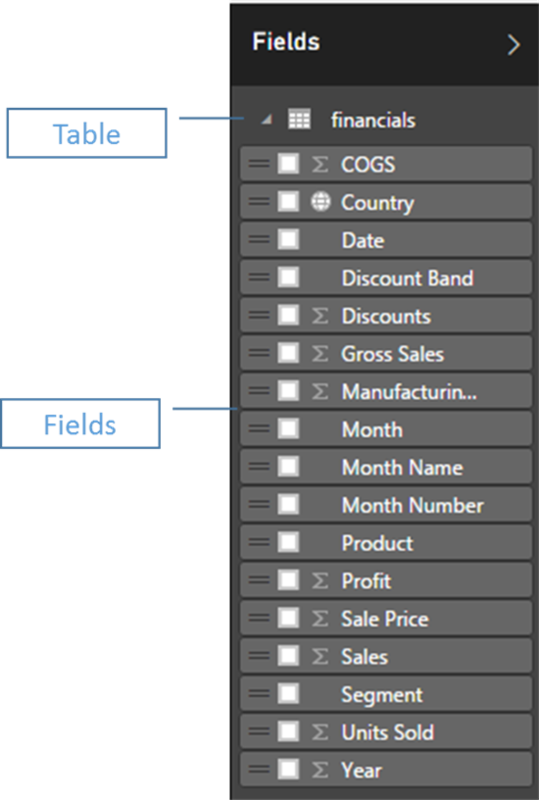 Before you can load your Excel file into Power BI, you must organize your data in a flat table. This means that each column contains the same data type–for example, text, date, number, or currency. You should have a header row, but there should not be any column or row that displays totals. Next, format your data as a table. In Excel, on the Home tab, in the Styles group, click Format as Table. Select a table style to apply to your worksheet. Your Excel worksheet is now ready to load into Power BI. 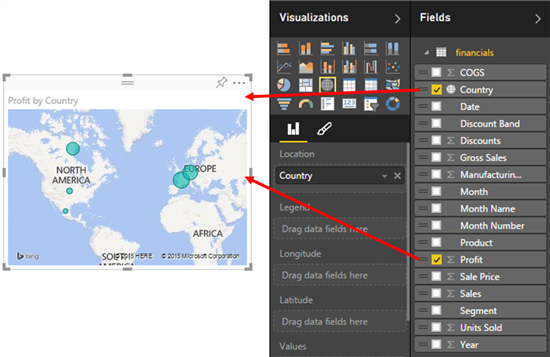 Power BI connects to many data sources, including Excel files that live on your computer. To get started, sign in to Power BI (if you haven’t signed up, you can do so for free). You want to create a new dashboard. On the left, under My Workspace, next to Dashboards, click the plus symbol. Enter a name for your new Dashboard. Then, at the bottom of the left pane, click Get Data. On the Get Data page, under Import or Connect to Data, in the Files box, click Get. On the Files page, click Local File. 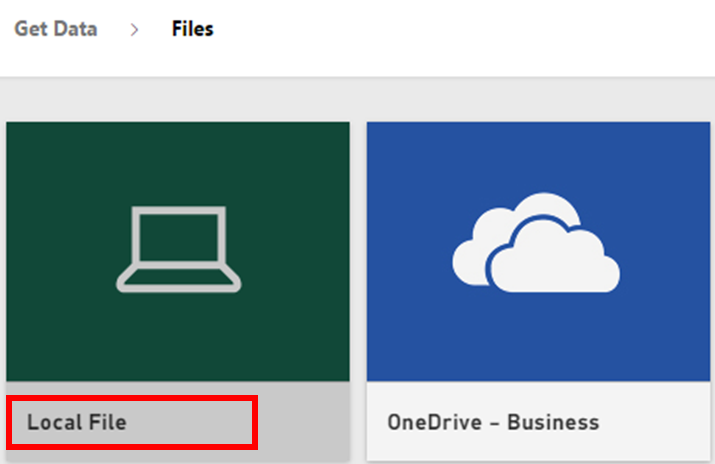 Navigate to your Excel workbook file on your computer and select it to load into Power BI. After Power BI loads your Excel worksheet, start building your report. On the left, under My Workspace, in the Datasets section, click the dataset that you just imported. 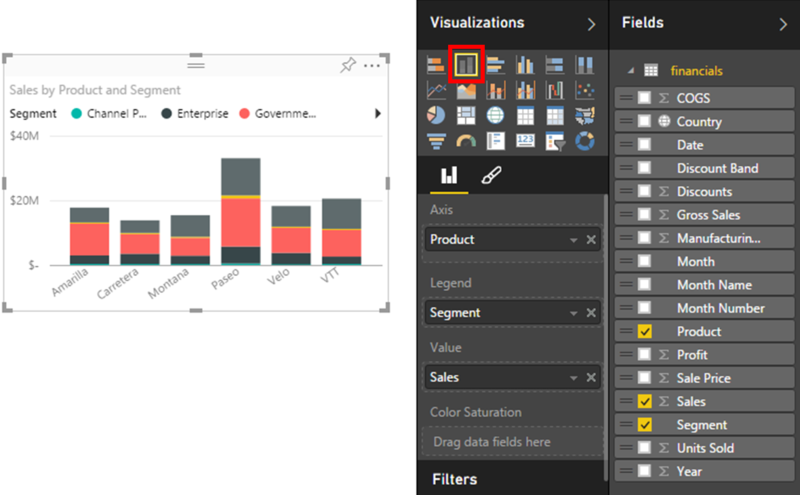 Power BI displays the report canvas. On the right side are the Visualizations and Fields panes. Notice that your Excel data table appears in the Fields pane. 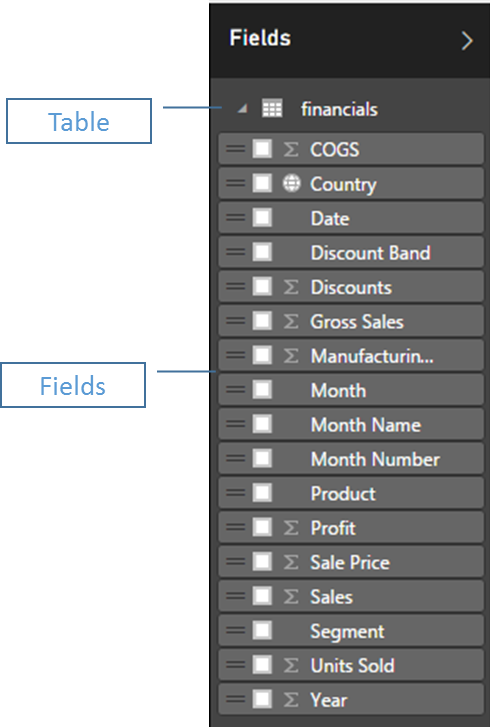 Under the data table, Power BI lists the column headings as individual fields. Now you can begin to create visualizations. Your manager wants to see profit over time. In the Fields pane, drag the Profit field to the report canvas. 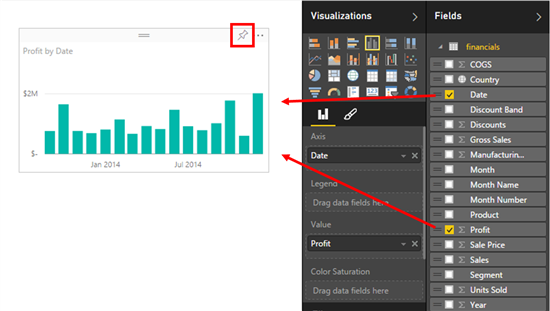 Power BI displays a bar chart by default. Next, drag the Date field to the report canvas. Power BI updates the bar chart to show profit by date. Your manager wants to know which countries are the most profitable. Impress her with a map visualization. From the Fields pane, simply drag over the Country and Profit fields to the report canvas. Power BI creates a map visual with bubbles representing the relative profit of each location. What about displaying a visual showing sales by product and market segment? Easy. In the Fields pane, select the checkboxes next to the Sales, Product and Segment fields. Power BI creates a bar chart instantly. Change the type of chart by choosing one of the icons in the Visualizations menu. Pin all of your visuals to your Dashboard. You’re ready to share it with your colleagues. You want to share your dashboard with your manager, Paula. 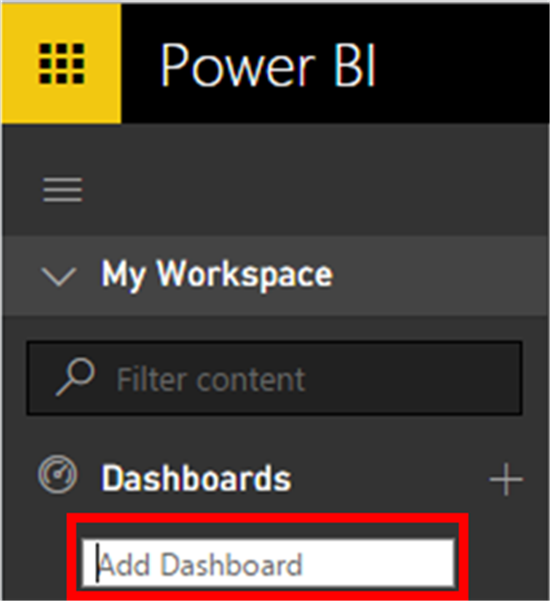 You can share your dashboard and underlying report with colleagues who have a Power BI account. They can modify your report, but cannot save changes. To share your report, at the top of the dashboard, click Share Dashboard. Power BI displays the Share Dashboard page. In the top area, enter the email addresses of the recipients. Add a message in the field below. 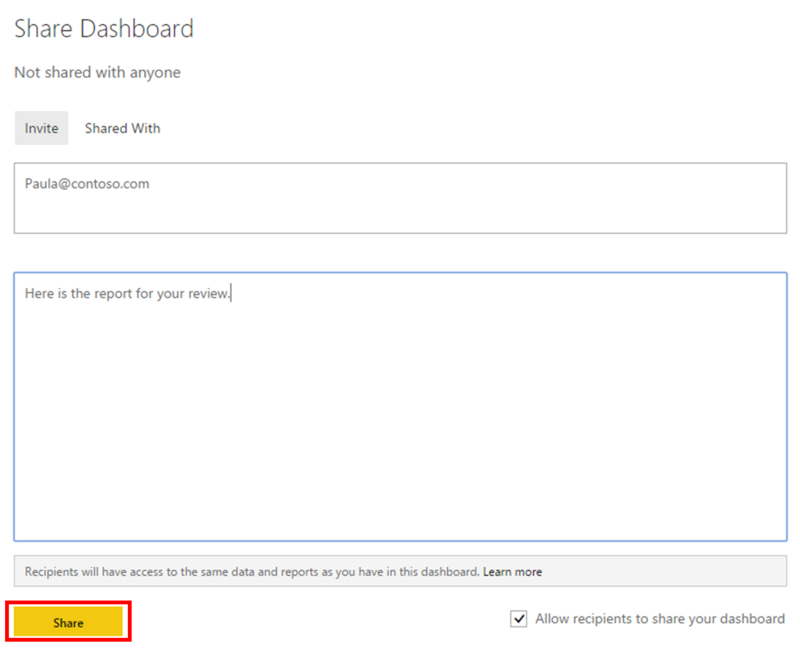 To allow recipients to share your dashboard with others, select the Allow recipients to share your dashboard checkbox. Click Share. Build reports from Excel worksheets in record time. Create stunning visualizations in minutes. Amaze your colleagues with shared dashboards. All with a single tool—Power BI. Try it yourself. Sign up for free today.